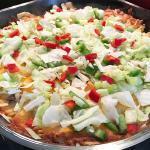 Quick and easy to make taco casserole recipe. A great weeknight or make ahead freezer meal that gives you all the flavor of a taco without the mess. Lettuce tomato, onion, jalapeno, sour cream, guacamole, salsa, etc. Brown the ground beef/chicken with the onion, drain if needed. Add taco seasoning mix and water to the cooked ground meat and mix well. Cook down until most of the liquid has been absorbed. Grease a 9 x 11 glass baking dish. Break up tortilla chips and place them in a thick layer on the bottom of the dish. Top the crushed chips with the hamburger and onion mix, half of the cheese and salsa. Add another layer of crushed chips and top with cheese.